The season opener for the factory SLC race car was at Autobahn this past weekend, begun with a 3-hour enduro to prove the changes for 2012. This year we began with the same successful foundation that carried the SLC to a National Championship last year, and added in a bit more power courtesy of a new engine program with Thomson Automotive. "Apparently those changes paid off as regular driver Ryan Ellis shattered the existing ES class lap record for the Full Course by over 9 seconds." "While the next- fastest car � a well-prepped BMW from Fall Line Motorsports� was running two seconds under the lap record, Ryan ran a lap that was 7 seconds faster than that." "The fast lap was set near the end of the race on full tanks, worn tires, and a cold track. So we think there is more there still to be gained when we come back." 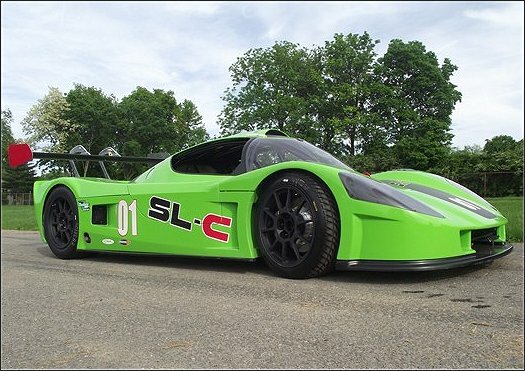 "We probably can�t keep up the record of capturing a lap record at every track we visit forever, but so far, that�s been the history for the factory Superlite SLC." "For those who haven�t been paying attention, the #01 SLC runs a stock chassis (save for a no-cost 2″ offset option), a stock body, and stock suspension pickup points. Even the engine is a relatively mild LS3, with several customer street cars running much more power." "And we race what we sell, and sell what we race, so you can be sure your SLC has the same record-setting DNA." "Our next race is at Summit Point Raceway in West Virginia, on June 16-17. Come out and take a look at the car in action. We think you�ll be impressed." "For the video fans, here�s a link to a video we shot during Saturday�s race:"